If diving is the passion of your loved one, this holiday season you can surprise him with the latest addition to Carl F. Bucherer’s Patravi family, the ScubaTec diver’s watch. Built to withstand a pressure of up to 50 atm, the case is protected by a helium release valve. You can chose between two versions, one with stainless steel bracelet with MSRP $6,800 or the more sporty looking ScubaTec with rubber strap at $6,400. Patravi ScubaTec. — Accuracy Taken To New Depths. Carl F. Bucherer presents the newest member of the Patravi family for holiday 2013: the distinctive Patravi ScubaTec diver’s watch is extremely robust and guarantees perfect readability. Deep under water as well as up above the seas. Precision and functionality are perfectly combined in this sporty timepiece. Integrated into the 44.6mm stainless steel case is the CFB 1950.1 automatic caliber, the accuracy of which is certified by a C.O.S.C. chronometer certificate. To ensure safety in measuring the duration of a dive, the bezel of the Patravi ScubaTec can only be rotated clockwise, so that the diver’s safety is guaranteed in the event of any accidental manipulation. The generously proportioned dial of the three-hand watch guarantees fast and accurate readability. Even in murky waters, the diver will still be able to tell the time, because the hands and markers are coated with Super-LumiNova® material that glows light blue in the dark. The black dial is well protected by a sapphire crystal almost 4mm thick. In addition, a helium valve ensures that, when the diver is descending and ascending in the diving bell, the gas escapes automatically so that the case will not be damaged. 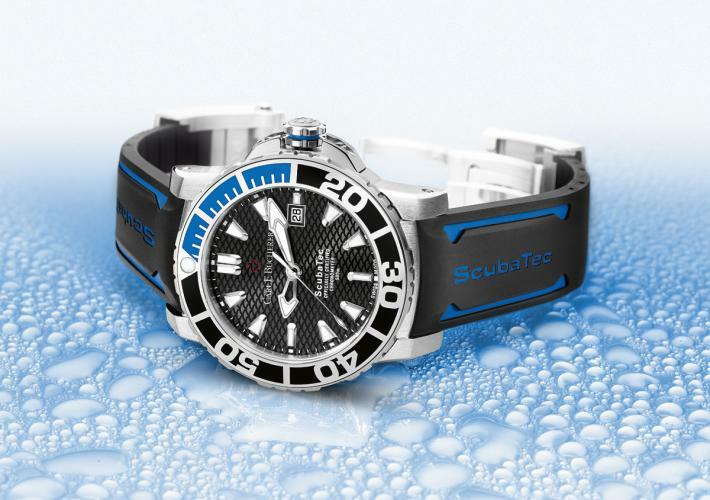 The distinctive design of the Patravi ScubaTec already indicates its function as a diver’s watch. 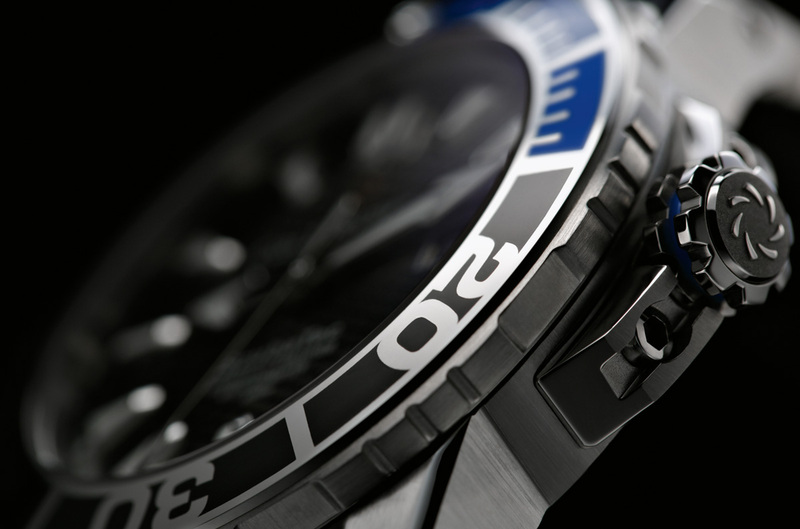 The glowing blue markers, the marking on the first quarter of the bezel, and the notch of the same color on the crown are symbolic of the sea. An extraordinary design detail is to be found on the back of the timepiece, where two batoid rays are depicted in relief with a 3D effect. 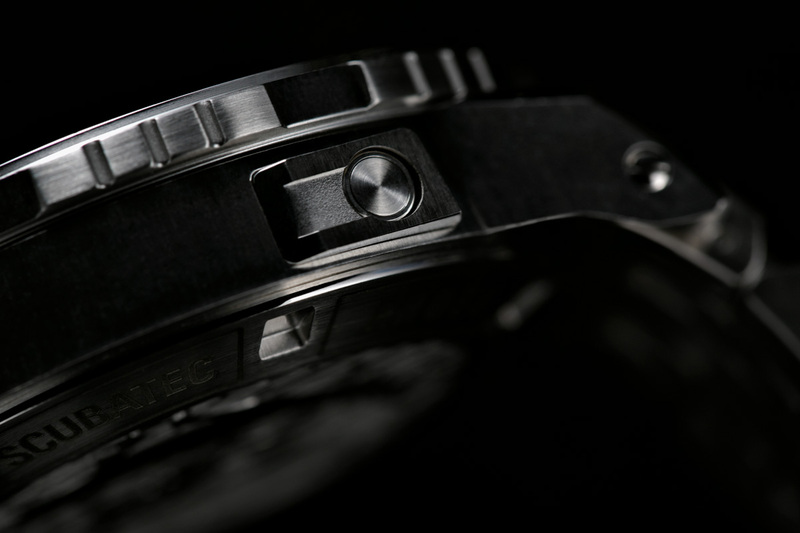 The bracelet of shiny and matte stainless steel creates a fascinating interplay of light and shadow, even when on land, recalling the shimmering surface of the sea. 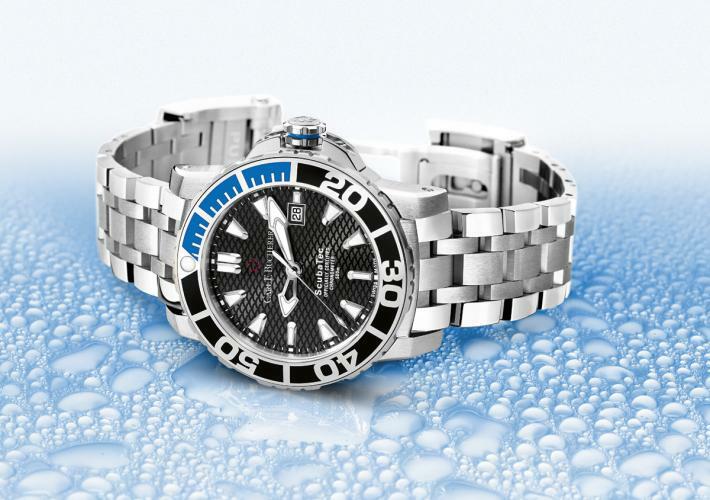 The unique combination of steel and two ceramic colors on the bezel is set against a background in a sporty ceramic blue shade that has been exclusively created for Carl F. Bucherer. The integrated bracelet extension makes the length of the bracelet individually adjustable, so that the Patravi ScubaTec is suitable for wearing over a diving suit as well as for everyday use.